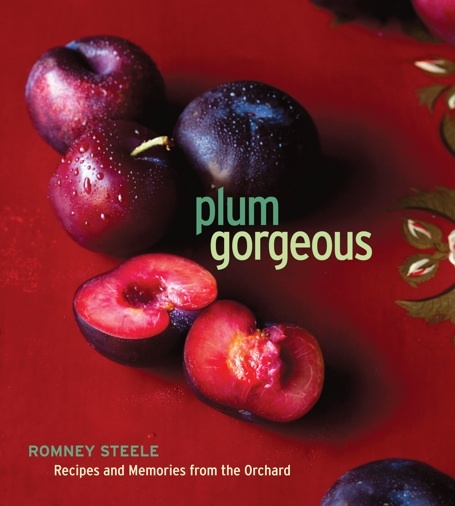 If you’re a person who reads cookbooks as much for stories as recipes, and aspires to an elegantly rural, abundant lifestyle, then Plum Gorgeous by Romney (Nani) Steele will speak to you. If you swoon over gorgeous photos of seasonal fruits set in dreamy tableaux, Plum Gorgeous, with photos by Sara Remington, will send you off into a never-never land of wistful longing. Steele’s first book, My Nepenthe, a memoir about growing up in the legendary Big Sur restaurant, was a personal account of the author’s relationships with her family and the history of a legendary place. Plum Gorgeous is loosely about Steele’s time living in a mountaintop orchard, but is more meditation than memoir, presenting snippets of observations and memories amidst fragments of poetry and quotations by writers as diverse as Rilke, Mas Masumoto, and Chekov—all interspersed with practical information about different fruit varieties and how to cook with them. The recipes are from the off-the-cuff, cook-with-what’s-on-hand school of cooking—the type of cooking you imagine happens on a farm or in an orchard, far from the nearest grocery store. The type of cooking that often happens in my own kitchen. I like that I can take an idea from this book and run with it, using what I have on hand, adding my own twist of inspiration, adapting at will. 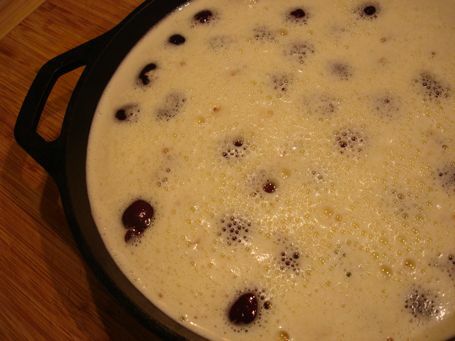 I was looking for a gluten free seasonal dessert that I could whip up quickly on a weeknight. I chose the cherry clafoutis in Plum Gorgeous. I’m no expert on gluten free baking, so I theorized that a dessert with such a small amount of flour would be a good candidate for a straight up gluten free flour substitution. I subbed rice flour for wheat flour, which worked just fine. I didn’t have any of the called for crème fraîche, so I used sour cream instead. I didn’t measure anything, just eyeballed it all in the midst of preparing supper. I used a hand blender instead of a blender-blender to mix the batter and then I skipped the step where I was supposed to strain it. Out of sheer laziness and in a rush, I put the raw almonds on top about halfway through cooking instead of toasting them separately. The indignities I inflicted on this recipe should have come back to bite me, but they didn’t. 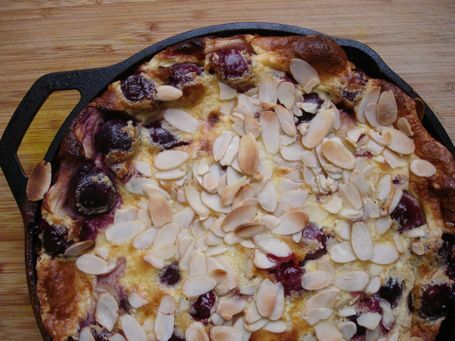 The crepe-like clafoutis batter rose up like a Dutch Baby, encasing the sugared and liquored up cherries in a puffy embrace. The top browned, as it should; the almonds became crisp. I scooped it from the skillet steaming, eggy, and fragrant. It was a hit. I should always be so lucky with my haphazard baking habits. The book is filled with similar seasonal fruit recipes that are forgiving, flexible, and uncomplicated. Come for the memoir and stay for recipes like Plum Soup with Basil Ice Cream; Heirloom Tomatoes and Peaches with Burrata; and Kumquats and Toasted Couscous with Halloumi. Or come for the recipes and be drawn into the memoir and photos. As for the photos, Steele and Remington worked in collaboration on them, and it shows. Steele is a gifted food stylist (she styled the food in DIY Delicious, which the super talented Remington also shot) and together, these two women know how to make a book a work of art. 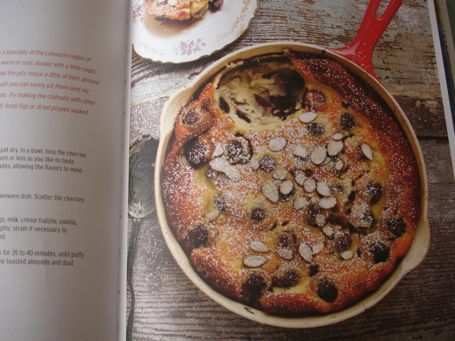 This entry was posted in Books, Food and Drink, dessert, entertaining, from the market, fruit and tagged DIY Delicious, Gluten free baking, gluten free cherry clafoutis, Nani Steele, Romney Steele, Sara Remington, seasonal fruit desserts. Bookmark the permalink. Post a comment or leave a trackback: Trackback URL. Thank you for such a lovely review, and for taking an idea and running with it. Exactly as I would hope. I love that you get it, that you see the poetry in the place, and that you appreciate our process that has become so much more than simply making a book. 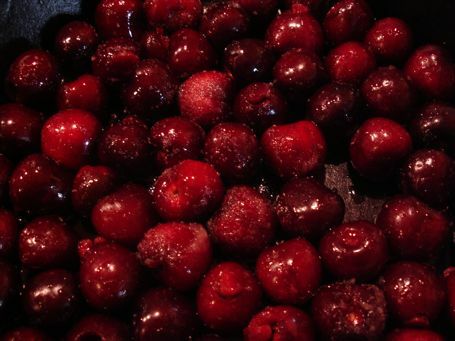 And by the way, I love your writing and descriptions…”cherries in a puffy embrace?” Oh my…YES. you’re so welcome. I know that book was a labor of love. It shows. You and Sara a duo to be reckoned with!